The Guardian: Apple has updated its new maps system after police in Mildura, Australia, said a number of people trying to find the town of 30,000 people became hopelessly lost in the bush. In October, Tim Cook issued a public apology for the poor quality of the maps and soon after fired the head of the iOS 6, Scott Forstall. The head of the mapping group is also reported to have been sacked in November. SYDNEY–Australian police are warning the public that errors in Apple’s much-maligned mapping application are leading drivers headed to the southern city of Mildura to take a potentially “life-threatening” wrong turn into the middle of a remote state park. 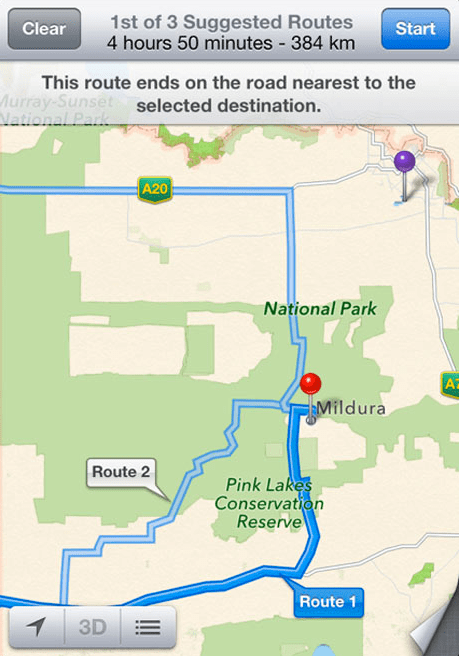 Victoria state police said this week that Apple’s Maps service places the city of Mildura about 70 kilometers (44 miles) away in the Murray Sunset National Park, a desert-like 5,000 square kilometer (1,900 square mile) region with scorching temperatures and virtually no mobile phone reception. Police have been forced to rescue distressed drivers who have gotten stuck in the rural area _ some of whom were stranded for 24 hours with no food or water and have walked long distances through tough terrain to access phone reception. “Police are extremely concerned as there is no water supply within the Park and temperatures can reach as high as 46 degrees (115 degrees Fahrenheit), making this a potentially life threatening issue,” police said in a statement. Earlier this year, Apple dropped Google Maps from its mobile operating systems in favor of its own mapping application, which has been criticized for bad directions, misplaced landmarks and missing towns. Apple CEO Tim Cook apologized for the mapping service in September and promised to improve it. In the past 30 days, six people have been stranded after turning into the park via a dirt road the Maps application recommends, Mildura police inspector Simon Clemence said. The track eventually opens up into rough desert terrain that is only accessible to 4-wheel drives. That’s where cars are getting stuck in the sand, Clemence said. “If you’re stuck out there in that you haven’t prepared, you’ve got nothing, you could be in a fair bit of trouble,” he said. Police received no response when they tried to contact Apple, Clemence said. By Tuesday morning, a day after police first went public with the problem, it appeared Apple had tried to fix the problem; drivers coming from the southern city of Adelaide are now correctly directed by the Maps application to Mildura, Clemence said. But drivers from Melbourne are still sent into the park. Apple did not immediately return a message seeking comment. With temperatures this week expected to soar in the region, Clemence said it’s critical the directions be corrected quickly.